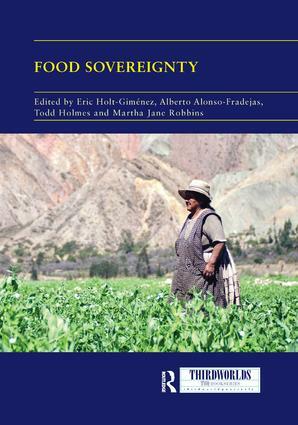 A fundamentally contested concept, food sovereignty (FS) has – as a political project and campaign, an alternative, a social movement and an analytical framework – barged into global discourses, both political and academic, over the past two decades. This collection identifies a number of key questions regarding FS. What does (re)localisation mean? How does the notion of FS connect with similar and/or overlapping ideas historically? How does it address questions of both market and non-market forces in a dominantly capitalist world? How does FS deal with such differentiating social contradictions? How does the movement deal with larger issues of nation-state, where a largely urbanised world of non-food producing consumers harbours interests distinct from those of farmers? How does FS address the current trends of crop booms, as well as other alternatives that do not sit comfortably within the basic tenets of FS, such as corporate-captured fair trade? How does FS grapple with the land question and move beyond the narrow ‘rural/agricultural’ framework? Such questions call for a new era of research into FS, a movement and theme that in recent years has inspired and mobilised tens of thousands of activists and academics around the world: young and old, men and women, rural and urban. This book was originally published as a special issue of Third World Quarterly. Food sovereignty and the quinoa boom: challenges to sustainable re-peasantisation in the southern Altiplano of Bolivia. Eric Holt-Giménez has been Executive Director of Food First since 2006. He is the editor of many academic, magazine and news articles, and lectures internationally on hunger and food system transformation. Alberto Alonso-Fradejas is aPhD Candidate at the International Institute of Social Studies (ISS) in the Netherlands, a researcher at the Transnational Institute (TNI), and a Fellow of the Guatemalan Institute of Agrarian and Rural Studies (IDEAR). Todd Holmes is a postdoctoral fellow with the Bill Lane Center for the American West at Stanford University. He earned his PhD in history at Yale University, where for four years he served as the Program Coordinator for the Yale Agrarian Studies Program. Martha Jane Robbins is a PhD Researcher at ISS in the Netherlands and holds a Joseph-Armand Bombardier Canada Graduate Scholarship.